The 2002 November rains had left the air breezy! 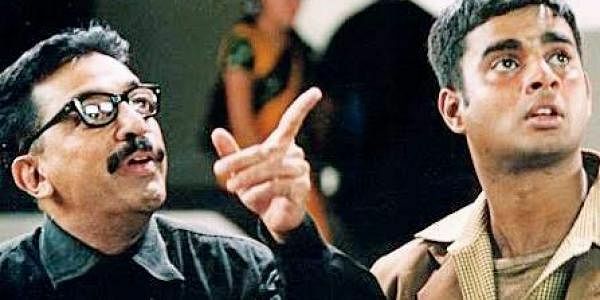 Anbe Sivam’s pre-climax shoot happened inside the erstwhile CampaCola compound in Guindy. Set-props were shifted around; some men pushed the trolley while others carried lights. The white Ambassador was parked in a corner and the lone camera stood still on its tripod. It was my first work-experience on a film — I landed-up doing the costumes and had the task of keying-in the script with a bit of research and crew co-ordination thrown-in. This was the pre-climax schedule and we had just a few more days to complete shoot. I opened the costume-door from the caravan as his familiar voice called, ‘Come let’s go for a walk’...! I was perplexed but by then knew he would never waste time on anything trivial, so I obediently joined his stride. He spoke on what the French meant by the term ‘mis-en-scene’ — an expression used to describe the design aspects of film-production, its “visual theme” or “telling a story”. He drew a parallel between the action-sequence of an earlier film and the ‘umbrella-fight’ we had just finished filming for Anbe Sivam where he sports a handle-bar moustache on his handsome frame. He shifted topics in non-linear order in his trademark hilarity but I was too tense to laugh aloud as the scene we had to shoot was a heavy one and the atmosphere was sombre. But he was narrating it all stress-free. I reminded him of what he told me when I got my first batch of clothes wrong. He explained how those ‘colours are not Balasaraswathi’ (heroine’s name in the film) and approved of the clothes we made thereafter, as costumes should ‘convey character’. He reiterated how important it is for a film to have regular ‘pre-production crew-meetings’. Common sense and catching-up with his references can make any technician shine in his unit. We had circled the building thrice and I wondered ‘He should be at rehearsal now?’ and then I noticed our unit grinning. After about 10 steps he stopped walking. I felt the arc-light glare into my eyes ‘damn...we are right before the camera’ I muttered and moved aside! He coolly turned to the director and said, “Ready sir! Take!” Walking round and round, I had lost sense of direction, but he arrived on the mark! As his co-actors took positions, Kamal Haasan in those double-lens spectacles, held the brown jute-bag, placed the false front-braces inside his mouth and transformed into Nalla. Madhavan’s Anbarasu tells Nalla he loves him like a brother and says, “Neenga yenn koodavey irukkanum, vaazhkai poora...” Nalla takes a pause, smiles and says “Idhai yean yenkitta mudhalliye sollala?” dismissing a choking-tear, as he gets past Anbarasu and gets into the Ambassador along with the mongrel. One of the finest acting moments on Tamil celluloid came alive that day in a single take!